I am the son of Michael Spirito, who passed away not too long ago. He loved his 1971 Magnum 27 Sedan so much and had continued to make tweaks and mods since purchasing it in late 2001. Over the years he owned several Magnums, a 35′ and also another 1973 27′ in the 1990s. I can’t begin to tell you how loyal he was to the Magnum brand and how proud he was of it. After starting a new career, I had been telling him how I’d hope to bring him to Florida to let him pick out his first new Magnum after I made it big and he’d respond that he loved what he had, which was true. Not a conversation went by that High Life was not discussed in one form or another. After work and on weekends he was usually found wearing one of his various Magnum polos cruising around the Greater Boston area or working on it in the garage or on the dock. 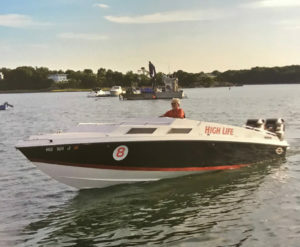 I just wanted to thank everyone at Magnum for providing such a great boat that gave my dad so much joy over the course of his life. I can’t wait for the day that I get to purchase my own and continue the family tradition. Nick at some point I’d like to meet you. I was a friend of your fathers. Miss the guy everyday. If are ever around let me know. This is a great thing you have done to memorialize your father.